The sun has set—literally, see above video—on another season for our Two Yellow Buoys anchored in Lake Michigan. Rest assured, they will be well-cared-for and back in action in the spring of 2017. 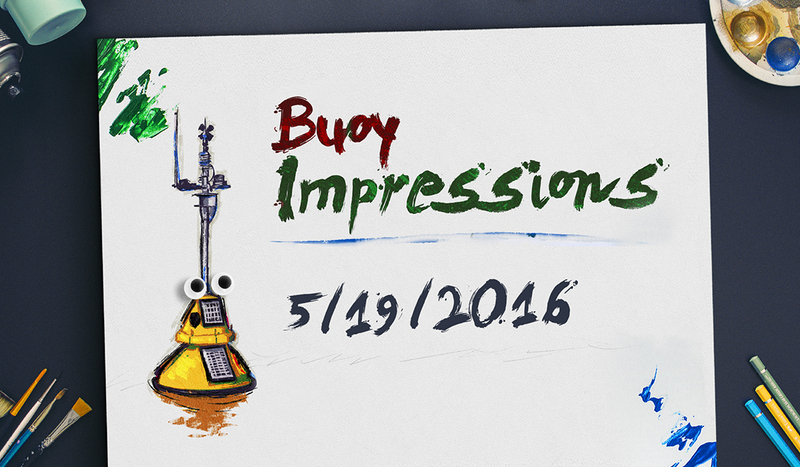 But if you can’t wait until next year to get your buoy fix, check #2YBHiatus on Twitter where there will be lots of data, discovery, and discussion! 1. The buoys are too delicate to withstand the Lake Michigan winter. The main reason to take the buoys out is that the lake ices over in the winter and the delicate instruments that take measurements also need to be cleaned and maintained to be sure we can keep transmitting the best data possible. 2. It is much easier to retrieve the buoys at the end of the year than to put them out in the springtime. You usually need one person to captain the boat and 4-5 people to help pull up the ballast weights and stop the buoy from bouncing against the boat. Although this year, the buoys were giving our scientists a little trouble. Don’t worry, though. Everyone is safe and sound on dry land! 3. The buoys are usually stored at the Purdue University West Lafayette campus in the civil engineering building. Sometimes they are stored at LimnoTech’s headquarters, in Ann Arbor, Michigan. The buoys tend to move around during the winter, especially if they need upgrades. So keep your eye out for buoys on trailers when you’re travelling down I-65 or I-94. 4. Every year scientists have to remove thousands of quagga mussels attached to the buoys. Quagga mussel veligers—a mollusk larval stage—floating around Lake Michigan are always looking for hard structures to attach to. Though some of the surfaces on the buoys are smooth enough to stop the quaggas from attaching, they always manage to find their way into nooks and crannies. We carefully inspect the buoys before leaving the lakeside and remove anything we see, either manually or with help from a hose. 5. The buoys receive thorough maintenance. The main hulls get washed off and all of the sensors are removed and cleaned. Depending on the sensor, this may mean an acid wash or just a good wipe down. One year, we had to replace a solar panel that had completely fallen off, so we’re always double-checking that everything is where it’s meant to be. 6. The buoys stop generating data, but all that’s been collected is ready and available online. The IISG buoy data pages—dashboards and graphs—are not active when the buoys are not in the water. Historic data can always be found via the National Data Buoy Center (Michigan City 45170 , Wilmette 45174 ). People who want to use the data should pay attention to notes like “Data have not been quality-checked.” Information marked with that tag may contain weird, fluke readings—like 100-foot waves! We try to do a quality check for the whole year of data within a few months of retrieving the buoy. People are also always welcome to email us to ask questions about the data.